I hope your day is as sweet as can be, filled with love and surrounded by the sweethearts in your life! Here is a little treat I made for the love's of my life this Valentine's Day. Nothing says I love you more than homemade pudding. 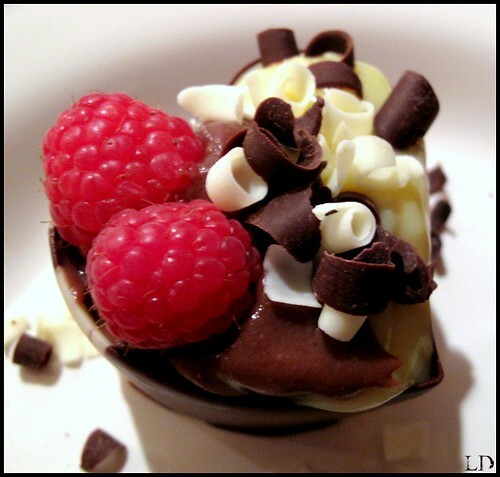 I assembled my pudding in already made chocolate heart cups topped with chocolate curls and fresh raspberries. Put 1 1/2 cups of milk and sugar into a saucepan, bring to a boil. Simmer over med/high heat then remove from heat. Do not let boil. Whisk the remaining 1/2 cup of milk, cornstarch, salt, and egg yolks, and vanilla in a bowl. Gradually whisk the hot milk mixture in with the egg mixture. Return the combined mixtures over medium/high heat whisking constantly until the pudding comes to a full boil. Reduce the heat to remain a simmer, continue whisking until the pudding becomes thick. Cover with plastic wrap so a skin does not form and place in refrigerator over night until set. In a medium saucepan over med/high heat, heat milk. Do not bring to a boil. In a bowl, combine sugar, cornstarch, salt. Pour mixture into milk a little at a time stirring to dissolve. Whisk eggs in a separate bowl and slowly add to the mixture. Whisk constantly until mixture thickens. Do not bring to a boil or you will scramble your eggs. Remove from heat and add vanilla and butter. Chill overnight.